Exploring History in Japanese Castles | What can I do with a B.A. in Japanese Studies? One look at my keychain (mostly chains, very few keys) will alert you to the fact that I am a huge castle nerd. Besides the fact that medieval Japan is my research specialty (and IMO the coolest time period ever, thanks – warfare! castles! art galore! ), I have always loved the sheer beauty and power of Japanese castles. This site is the kind of resource I wish I had stumbled across years ago to explore more of Japan’s rich castle history (and figure out where I wanted to tour on vacations while overseas). O’Grady has compiled a variety of historical and technical information on castles coupled with a spectacular array of photographs taken himself. O’Grady’s castle information is arranged conveniently in dropdown menus and sidebars, and can be searched by several categories, including region (all over Japan and also two castles in Korea! ), the main castle tower (whether it’s original or reconstructed), or whether the castle is with buildings or in ruins. All of these options are accompanied by copious graphics, and a search of the photos are divided up in individual categories of interior, main towers, turrets, interiors, gates, walls, buildings and bridges. Granted, not all of these categories are fully populated with photos, but one man can only travel so much! The individual castle pages are arranged with basic who, what, where, when technical information, as well as brief historical biographies of each castle, domain information on the clans who occupied the area at various times, a timeline concerning castle-related historical affairs, and finally the various types of historical recognition given to castles or parts of castles by Japan. 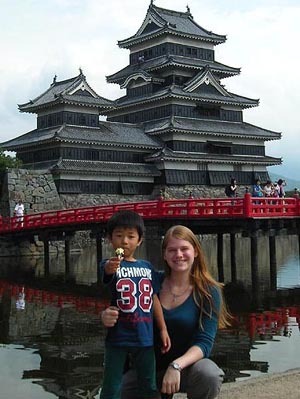 Some posts, such as Matsumoto Castle (a favorite of mine!) also feature personal videos from O’Grady’s trips these locations. Also great is the blog area of the site, where O’Grady posts on a number of fun and informative topics related to castles and his travels. His compilation of statistics on when castles lost their tenshu (castle keep, or main tower) and the costs of rehabilitating castles are pretty amazing, but you’ll have just as much fun checking out info on the Japanese castle in Inception and what squatting on the throne in a Japanese castle was like. Castle props: My host brother and me at Matsumoto castle! Navigating the site is very easy and the design is clean and appropriate. If I had to stop fangirling for a moment and be nitpicky, I would say that my only complaint is that there aren’t links to the Japanese homepages of these castles featured or brief tourist information on the webpages to make traveling to these places easier for non-Japanese speaking tourists. Of course, that isn’t necessarily the goal of this site, so it’s easily overlooked. If you’re interested in learning more about Japanese castles or just seeing some spectacular photography, procrastinate on that paper and definitely check out the Japanese Castle Explorer! 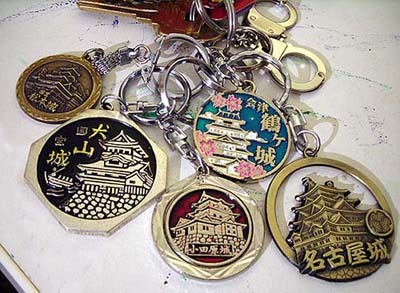 This entry was posted in culture, fun links, living abroad, study tools and tagged blog review, blogs, castles, culture, history, Japan, Japanese Castle Explorer, Japanese culture, maps. Bookmark the permalink.